Slayton House and celebratingcolumbia.com are currently exhibiting a series of portraits to commemorate Columbia's 50th Anniversary. The exhibit is about "gratitude to Rouse and to those who made [his] vision a reality and to those who continue to keep the vision alive," says artist Mary Jo Messenger. 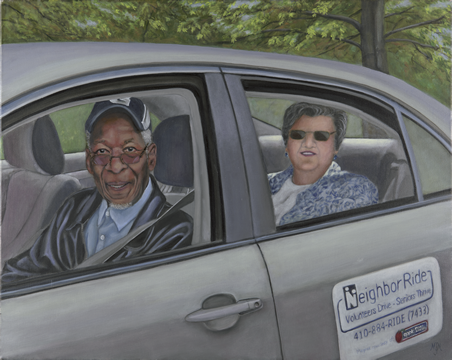 We are excited that Neighbor Ride, current driver Clinton Edwards and our founding President Judy Pittman are featured prominently! The exhibit runs through August 12 at Slayton House 10400 Cross Fox Lane, Columbia. We raised $487.57 from the Tino's Restaurant night! Thanks to all of you who participated. We would like to express our gratitude for the generous contributions of outgoing Board Members: Andy Carmer, President; Bill Howard, Treasurer; and Sharon Rossi, Member. We would like to welcome to their new roles, Bob Engelbach, President; Andy Cohen, Vice President; Amy Spanier, Secretary; Roy Appletree, Treasurer. We would also like to welcome new Board Members, Mary Aquino, Senior Attorney, Maryland Legal Aid; David Nitkin, Chief of Staff at Howard County General Hospital; Donna Snyder, Community Relations Coordinator at Millers Grant; and Richard Fornadel, Physician and Retired Health Care Administrator. For more information on the Neighbor Ride Board of Directors please see our website. Neighbor Ride is so sad to announce the passing of Volunteer Driver Dave Carter. He was a high volume driver since he started in January of 2014. He will be missed by us and the many passengers that he transported. He is survived by his wife Mary. "I am very pleased with your program! Your representatives are extremely kind and professional." "This was our first ride. The driver was pleasant, engaging and knowledgable about directions and a competent driver. We were glad to meet her." Just a reminder that the deadline to sign up for the free online AARP Smart Driver course is July 15. Many insurance companies provide a multi-year discount to those who take the course. Please email Holly or Patrice for a coupon code you will need to take advantage of the free offer.